On the night of August 10, the central oxygen pipeline in the college premises started beeping, indicating low supply of the gas. The doctors and hospital staff knew that the supply could be maintained through emergency cylinders, but only for two hours. They did not know what to do after that. Khan knew that uninterrupted oxygen to critically ill children, was the only life-saving medicine, to save lives of those suffering from encephalitis. A few called up the supplier, only to be told that they will send fresh supplies only after clearance of their dues. Refusal from other suppliers caused more panic in the hospital. But Khan did not lose hope. He drove two hospitals employees in his car to his friend’s private nursing home and borrowed three oxygen cylinders. Before leaving the hospital, he had given standing instructions to junior doctors on duty and paramedical staff to keep pumping Ambu bags if the oxygen supply further reduced in the central pipeline. Khan loaded the three cylinders in his car and rushed back to BRD Hospital. However, the oxygen content in the cylinders was enough only to provide half an hour of supply in the central pipeline. By now, it was 6 am and several critical children were developing convulsions for want of oxygen. Khan left the hospital again and made a round to other nursing homes known to him. He collected as many as 12 oxygen cylinders. The child specialist made four trips to the hospital to ferry these cylinders for children admitted in his ward. When he returned to the hospital, he was informed that a local supplier was ready to supply oxygen cylinders on cash payment. Dr Khan gave his ATM debit card to one of his employees and withdrew Rs 10,000 to bring in more oxygen for patients. He also paid for diesel and other expenses to truck drivers who brought fresh supplies from Faizabad. This sounds like a story, just out of films. However, there seemed to be a twist in all this after just 24 hours. If all this was true, why was Dr. Khan, who was the nodal officer of paediatrics department, sacked on Sunday evening? What could have gone wrong? While the official reasons of why he was removed from his post are not known, some twitter users had made some startling revelations. This is news of one Dr. Kafeel Ahmed, from Gorakhpur, who has a clinic in Rustampur, accused of molesting a woman, in March, 2015.
Who Dr. Kafeel from clinic in Rustampur? Perhaps this one? 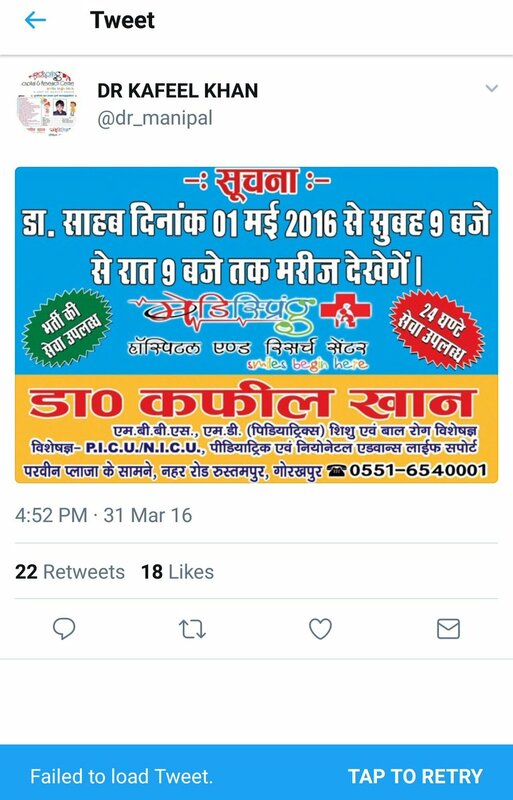 Screenshot of tweet allegedly done by Dr. Kafeel Khan about his private clinic [hmm, are doctors in Government hospitals allowed to have a private practice?] in Rustampur. Is he the same Dr. Kafeel from the molestation case? Wait, is he the same Dr. Kafeel, who was suspended from Manipal University in 2013? Or the same Dr. Kafeel, who was arrested in Delhi in 2009 for impersonating someone in National Board Exam for medical registration? Even as we wait for know real reasons why Dr. Kafeel Khan was sacked, here is something to chew on. Perhaps we are too quick to hail someone as a hero, especially in face of tragedy. Let us pray for the souls of those children who died too young, and make sure such a tragedy doesn’t end up being mere statistics. UP Government, wake up. We are watching you. Update: Kafeel Khan, the doctor in question was questioned by the media regarding the removal. While he called it a smear campaign, he didn’t deny the accusations by asking as to why were past controversies being raked up now. Other reports have made another severe allegation that Khan used to steal oxygen cylinders from the BRD hospital for his private clinic. The report claimed that on August 11 he hurriedly sent 3 oxygen cylinders from his clinic to BRD hospital while claiming that he had merely borrowed them. Dr Rajiv Mishra the Principle of the college who was sacked on Saturday was also believed to have been in cahoots with Dr Kafeel Khan.